European officials however played down the delay, not wanting to rekindle memories of the eurozone debt crisis that nearly destroyed the Europe’s single currency. 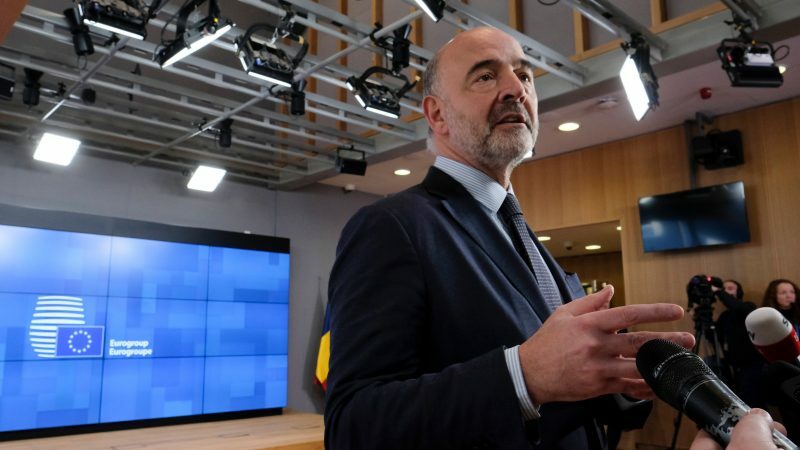 “It’s too early to decide formally on the disbursement today,” said EU Economics Affairs Commissioner Pierre Moscovici ahead of a Eurogroup meeting of eurozone finance ministers. “We are particularly focused on the reform of the Katseli law”, he tweeted. The so-called Katseli law, named after former economy miniter Louka Katseli, shields household from losing their primary residence in case of insolvency. Growth is expected to reach 2.4% in 2019 after an estimated 2.1% in 2018, according to the latest International Monetary Fund (IMF) projections. So let’s get this straight: ECB and euro-zone “central banks” (i.e. ECB glove puppets) profited from buying Greek gov bonds at low prices and are now reselling them – at higher prices. The money from the profits will then be partially given to Greece. Every disaster has a silver lining eh! As for ““The signal given to the markets is decisive”….that would be the BOND markets – as somebody once remarked (US financier I believe), if I’m reincarnated I want to come back as the bond market – that way I can frighten everybody. Raising the question: is this a case of the Bond tail wagging the EU dog? Of course the above raises a couple of other questions & opens some doors. If the ECB sees bond buying and selling as a profit centre (it’s actions would suggest this is the case – because otherwise it would hold the bonds to redemption) then what is to stop it from buying and selling Green Bonds. For example: what is to stop the EIB selling bonds to the ECB & the ECB then selling the bonds on the bond market. The Euros from said bonds being used by the EIB to fund energy efficiency and renewables projects in Europe. I expect no response to the above from the MoTUs (masters of the universe). Why prolong the pain of the Greeks? Enough of making them suffer. How far is austerity and neo-liberal thinking going?